Bitcoin price is on a path of breaking barrier below $7,000. BTC/USD must find a support above $6,900 to avoid yet another break down towards $6,800. Bitcoin price settled above $6,900 following the overarching declines on Friday last week. Since then it has been pivotal at the $7,000 level, although the upside appears to be limited below $7,150. The price picked up the pace on Monday 6 during the Asian trading hours. BTC/USD broke out using the support at the 50% Fib retracement level taken between the highs of $7,163.59 and $6,891.73 lows at $7,028.08. The price attacked the short-term resistance at $7,075 but failed. Subtle lower corrections continued but a reverse trend occurred at $7,040. Bitcoin sprung up into an engulfing candle that was unstoppable until the intraday resistance at $7,150. The buyers lack the support to maintain the price above $7,000. Besides, at the time of press another bearish wave has sent Bitcoin tumbling past the trendline support at $7,080. Furthermore, the 50 simple moving average in the 15-minutes timeframe chart did very little to prevent the slide below $7,000. 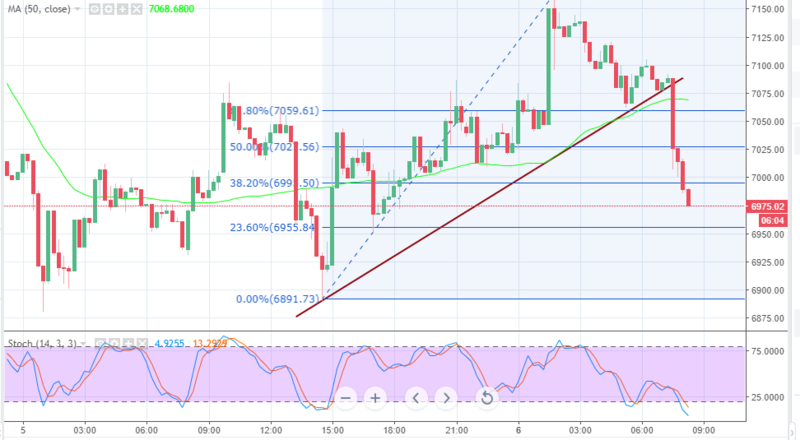 BTC/USD is testing the support at $6,950, however, it is likely that the price will break down into the $6,800 range. $6,900 is both a support and a break down; if the price finds support above this level, a reversal towards $7,000 will follow. However, a slide below $6,900 will have Bitcoin breaking down into another downward spiral towards $6,800. Indicators on the chart at this time are highly bearish but it also means that the sellers are getting exhausted and the buyers could find an entry.